As part of its 100th anniversary celebration, the Harrisonburg-Rockingham Chamber of Commerce dug up a time capsule it had buried 50 years ago. “We wanted to dig it up on the official day that we got our charter signed, which was April 26, 1916,” says Frank Tamberrino, the chamber’s president and CEO. Other items in the capsule included a tube of Brylcreem, some annual reports, a zoning code, a land use plan and two pairs of pants, one from Metro Garments and the other from H.D. Lee, two garment companies in the area at the time. “Garment companies were important here in the 1950s and 1960s,” Tamberrino says. During the event, the son of a former H.D. Lee employee read a note his father had put in one of the pairs of pants. The note explained the permanently creased pants were from the company’s facility in Broadway. All of the artifacts are now on display in Tamberrino’s office. “We are scanning some of the items and they will eventually make their way to either James Madison University’s special collections library or the Harrisonburg-Rockingham Historical Society, which has The Heritage Museum in Dayton,” he says. 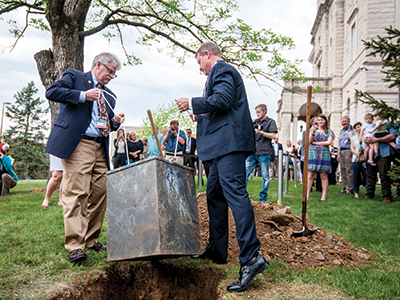 The chamber plans to bury another time capsule in the same spot on Court Square in June or July. “We are taking suggestions from folks as to what should go in there,” Tamberrino says.